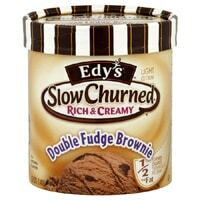 Click here to request your free coupon for a Free Cup of Edy’s Slow Churned Light Ice Cream. Just like them and click “Scoop Up A Free Cup.” Then fill out a short information form to receive your free coupon. Hurry they only give out a certain number daily. I love Edy’s!!! I can eat there ice cream all the time!!!!! Double fudge brownie is the BEST! I love Edy’s ice cream!! I would love to cool off with some of this yummy decadence!